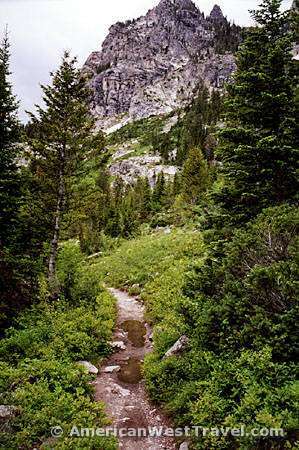 The Teton Range in Grand Teton National Park is considered by many to be the world’s most scenic mountain range. 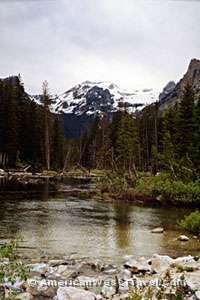 The mountain chain rises abruptly and dramatically from an area of prairie and rolling hills. There are many vista points along the park roads where visitors can park their cars and take pictures of the awesome views. Our experience at Cascade Canyon included a beautiful (and inexpensive) boat ride across Jenny Lake, an unbelievable waterfall, a great vista point, and a canyon where snow covered mountains rise thousands of feet straight up. The spring runoff assured awesome scenes of flowing water. Jenny Lake lies right at the foot of the mountains. The park concessionaire provides a scenic boat shuttle across the lake from the Jenny Lake Visitor Center to the mouth of Cascade Canyon. 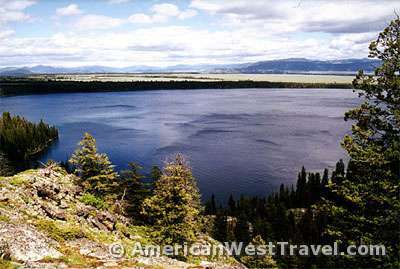 As an alternative, one can hike around the lake (4 miles round trip). 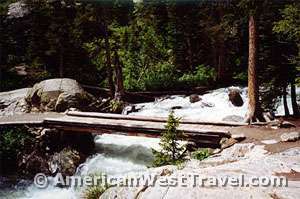 Hikers get to walk the narrow foot bridge (photo, right) above raging Cascade Creek! Hidden Falls lies about 1/4 mile upstream from the boat dock. On this steep gradient it is obvious where “Cascade” Creek got its name. 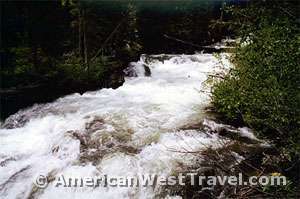 Today the stream is a spectacular torrent but it is nothing compared to the falls. You hear the roar of Hidden Falls before you can actually see it. Another apt name. A sign, saying “View Point, 100 feet”, points through a thick group of trees. You walk the trail, then the view suddenly appears. And, it is a stunner (Photo left). The falls are about 250 feet high, and the water flow is enormous. The roar, the mist, the concussion of the falls, combined with the sudden appearance make a powerful impression. Slack-jawed visitors stare in awe. Another 3/4 mile of uphill walking brings you to the magnificent vista at Inspiration Point shown at the top of this page. Most of the visitors turn back at this point, thinking that they’ve seen everything. This is ironic because the subsequent hiking up canyon is relatively level and quite easy. It is also a spectacular canyon. 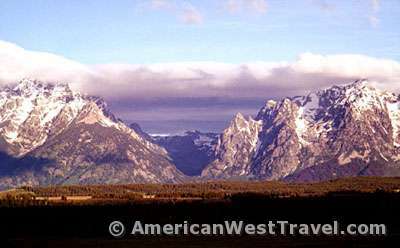 The huge alps of the Teton Range rise thousands of feet almost perpendicularly above Cascade Canyon. The heavily forested lower elevations of the canyon suddenly give out at timberline leaving vertical slabs of rock covered by snow at the higher elevations. 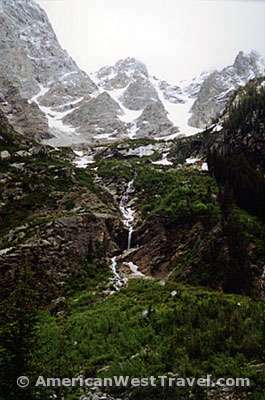 Drainage channels conduct melting snow thousands of feet down the slopes into Cascade Creek. Waterfalls are everywhere. The one shown right is probably about 200 feet high. The finest views are the group of huge peaks just south of the canyon (photos, left and both at right). The photo far right is a closeup sliver of the other two photos. 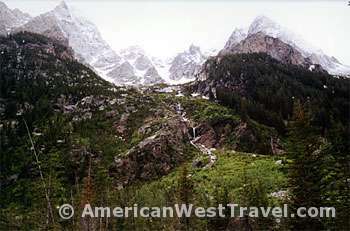 Besides a good view of the falls, it shows the progression from the wooded canyon bottom to the rocky, snowy peaks. 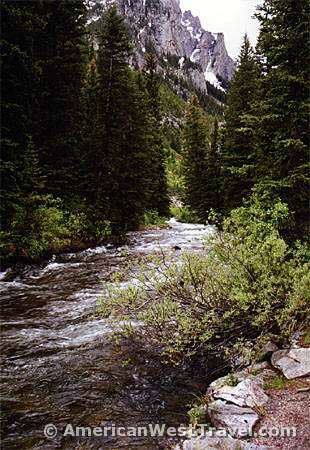 The photo, below left shows the peaks rising from a creek side perspective. The narrowness of the canyon enhances the dramatic nature of the views. Our day in this “beyond magnificent” wilderness ended all too quickly. 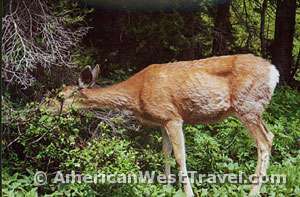 We urge everyone to go beyond the road and discover the American West’s hidden treasures!